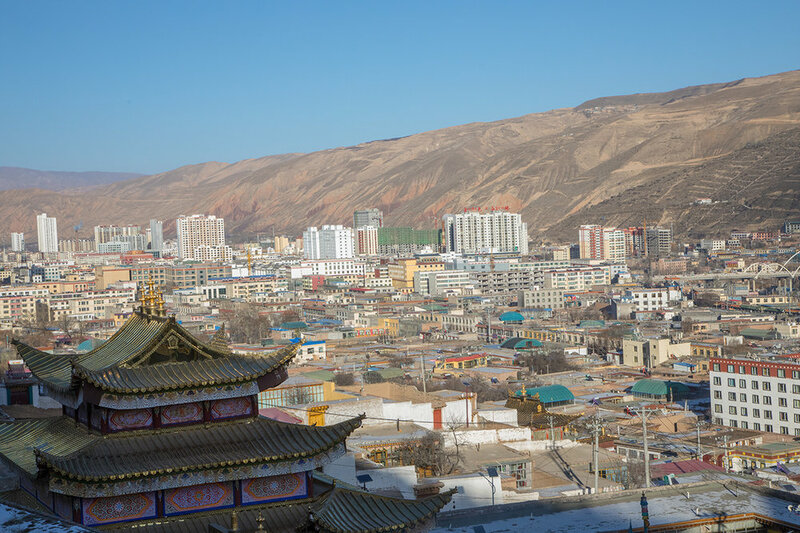 Qinghai, Rebkong, a valley 2500 high up amidst the mountains of the Tibetan Plateau. 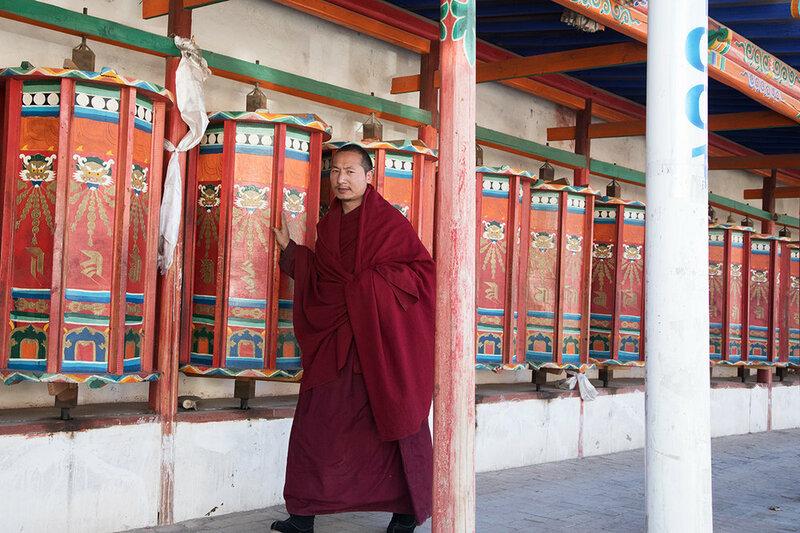 We are sitting inside the apothecary which belongs to the famous Tibetan monastery of Rongwo, one of the biggest in Qinghai and home to more than 800 monks. Dispensing medicine and attending to people's ailments, the apothecary looks a little run down, but there's a good feel to the place, here in the heart of town. 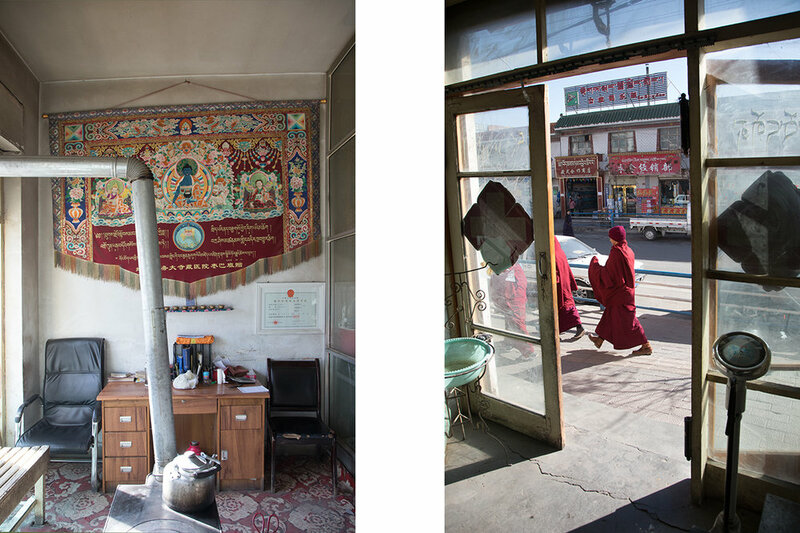 The apothecary belongs to the infirmary of the Rebkong monastery. 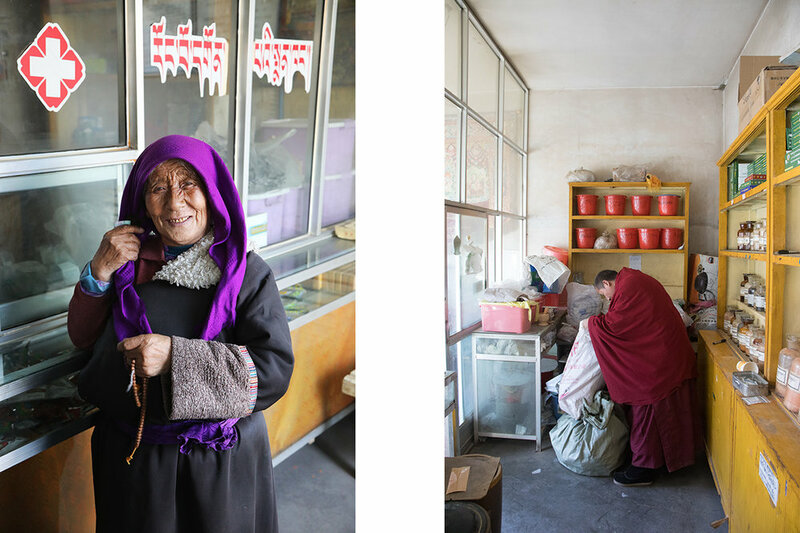 Tibetans, members of the Muslim Hui minority and Han Chinese all live side by side in what used to be an almost exclusively Tibetan region. 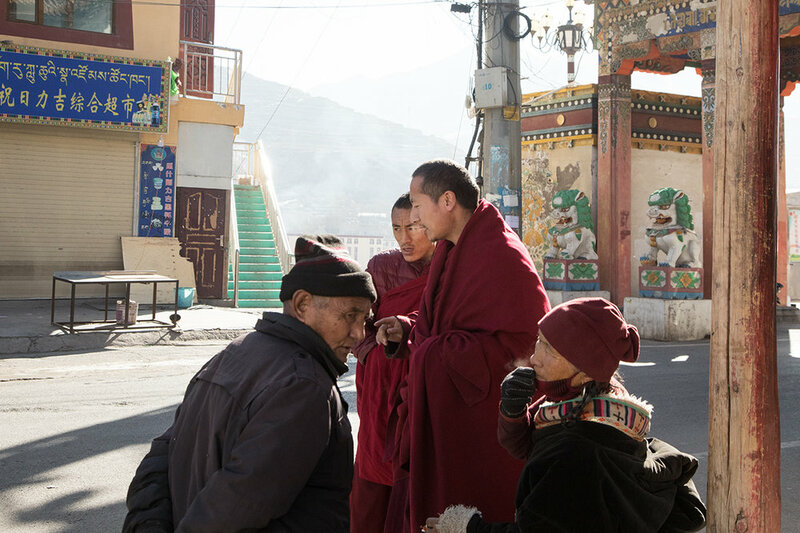 Rebkong is a small town of around 80,000 people, with streets full of colourful Buddhist shops selling the celebrated thangka paintings, malas, incense and golden Buddha statues. In other streets, busy with Hui Muslims, slaughtered lamb carcasses hang in their hundreds. The Han Chinese run businesses here too, adding to the unique sound of this jumbled town known as Rebkong to Tibetans and Tongren to the Chinese. 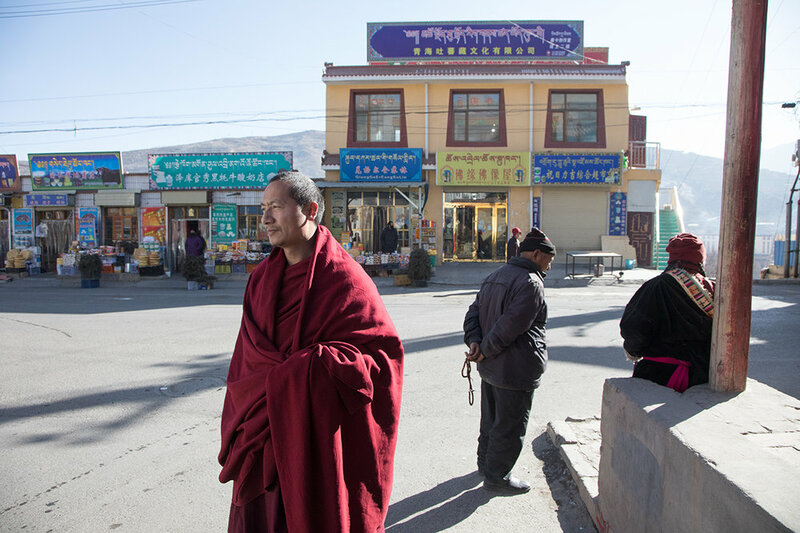 Suppressed by the Chinese government, the Tibetans here and in other regions share a history of turmoil, revolts and self-immolation. The Dalai Lama was born not far away. It strikes me that the police presence is less obvious, or at least not so demonstrative as on previous visits. We sit on a bench in the examination room, a multi-purpose room really. Tea is boiling on an old oven which also heats the small room. The sun shines through the window, nicely warming our backs. Next door, the shelves are stacked with a wide variety of herbs for sale, their earthy shades so different to the colourful spectrum of Chinese medicines. We help Yeshi to pack little herb globules, prescribed to strengthen the liver. We weren't expecting to work in the monastery's apothecary, but I savour the moment, I haven't felt so peaceful for quite some time. My camera sits next to me whilst Buddhist chants ring through the air outside. Yeshi picks up my iPhone and takes pictures of us while we work. He concentrates really hard and the photographs he takes prove to be really good. It's an unusual feeling for me to be seen, the subject of the image. I could have stayed sitting there for hours but after a while all the sorting and packing was done. Who is this special monk? We feel so comfortable when we are with him. Little by little, we get to know him better. As we follow him through the streets, he greets one person after another, so many people are eager to talk with him and ask for advice. He finds time for each and every one of them. I find it hard to put it into words, this shining aura of his. Yeshi, monk of the Gelugpa school, Tibetan physician, teacher and soon to qualify as a geshe or “virtuous friend”, a Buddhist academic title, much like a PhD. Years of arduous study and tough examinations are required to graduate as a “protector of Buddhist wisdom”, 20 years of learning to attain the highest degree. A geshe is a scholar, not a spiritual master like a lama. Nevertheless, many lamas have undergone geshe training and the dalai lama himself is also a geshe. 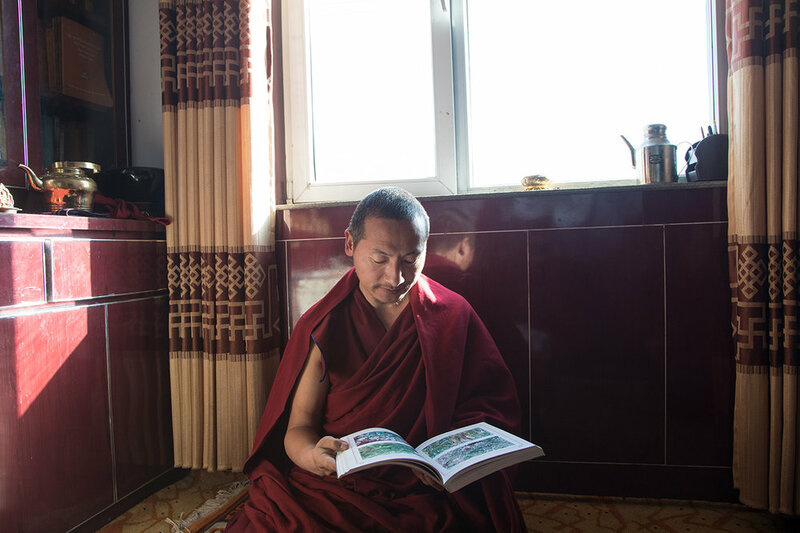 During the day, Yeshi is a doctor and works in the apothecary, in the evenings he spends long hours teaching Buddhism and Tibetan language. He still finds time to answer his students' questions, often on the phone, late into the night. Thousands of pupils of all ages have benefitted from his instruction over the years. We enter the small apartment to find towers of books piled up everywhere and an altar. Yeshi's student brings us bread and butter tea. We sit on the floor and chat for a while before we set off together. 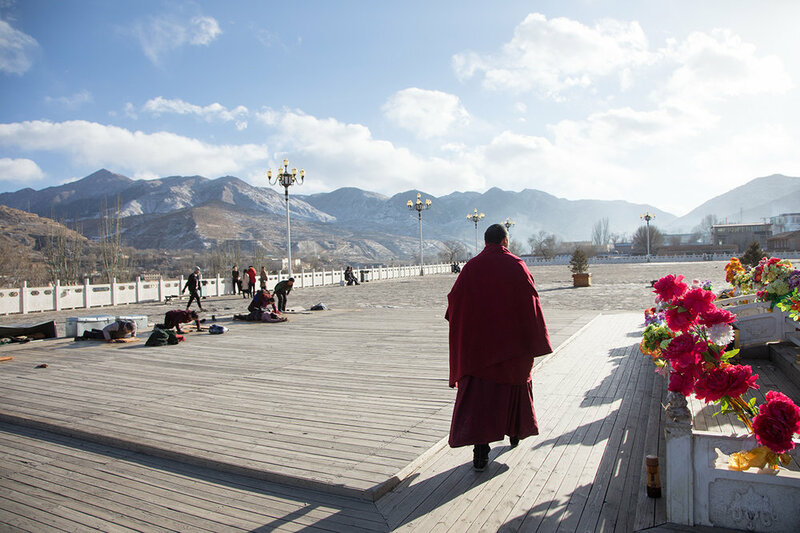 We learn about Tibetan medicine which is closely related to Tibetan Buddhism. It was founded by a monk. Body, soul and spirit are seen as one. Treatments with herbs, massage, moxibustion, cupping and acupuncture are accompanied by Dharma and Tantric medicine, which focus on the spirit and ethereal body, practised by monks and lamas. The teachings are based on the “three fluids” wind, gall and mucus or phlegm. Disturbances to the three fluids through destructive emotions or unhealthy living lead to an imbalance which can cause illness. We are soon back in the apothecary and the monastery's small clinic. 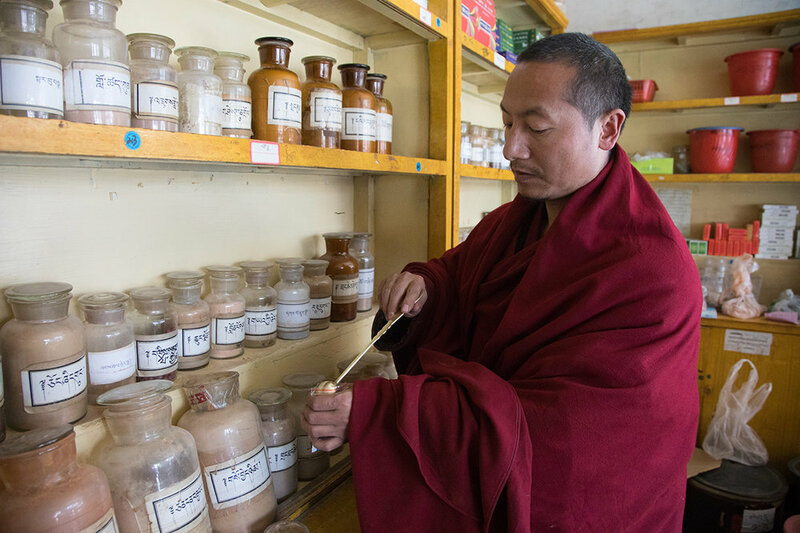 Almost all of the medicines sold here are manufactured at the monastery, the herbs are gathered from the surrounding area. 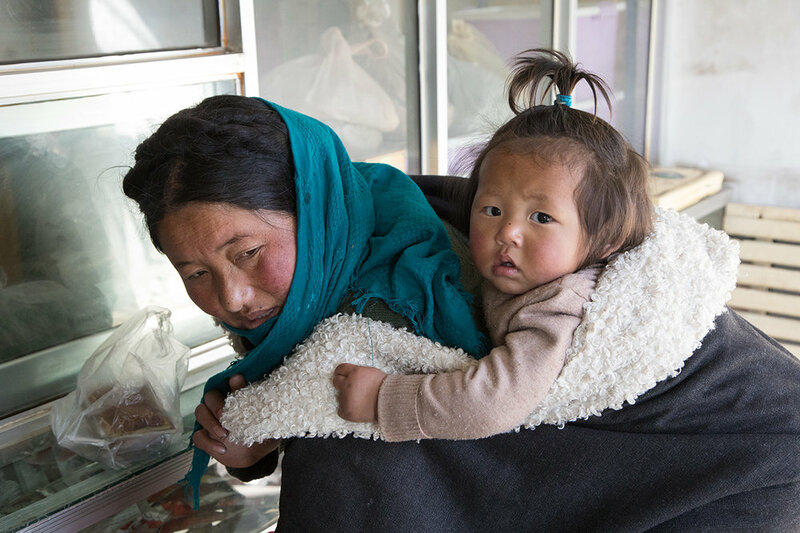 As patients arrive, Yeshi offers advice and sells medicine to them. I am surprised how cheap everything is – the principle is that everyone should be able to afford what he or she needs to get well or to stay healthy. Many Tibetans use herbs for prophylactic reasons, they are aware of their own frailties and use Tibetan medicine to strengthen their bodies. 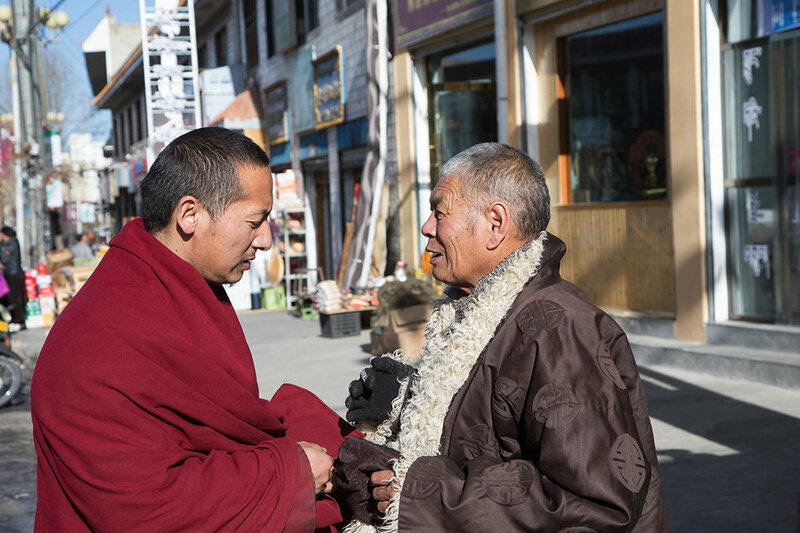 Yeshi explains that faith is an important element of healing in Tibetan medicine. 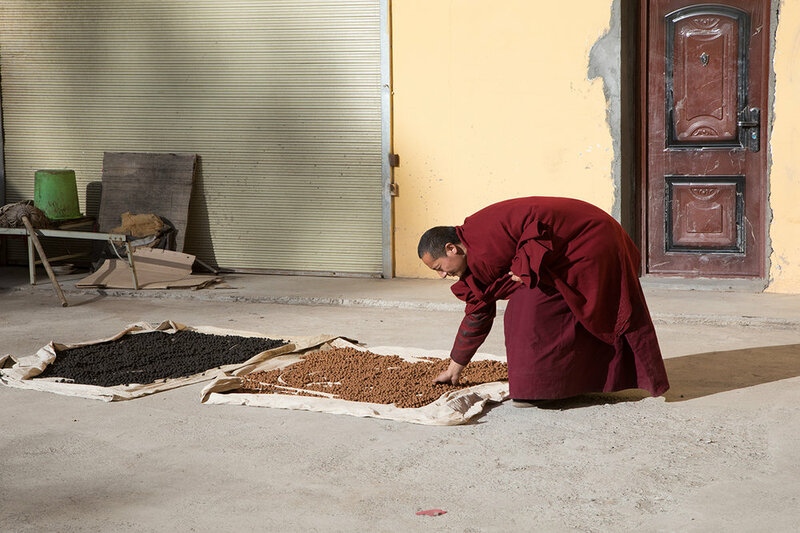 The fact that the monks produce their own medicine here in the monastery is seen as a form of extended spiritual support, beyond the medicinal properties of the products themselves. He is right, of course. Belief can have a powerful effect on the healing process. He tells us a story about the placebo effect. Two men, one healthy, one suffering from cancer of the liver, undergo examinations. Their results get mixed up and the sick man goes home believing he is healthy, whilst the other goes home and feels weaker and weaker. The sick man is cured simply by his own belief that he is healthy. The other feels sicker and sicker until he goes back for a second examination. On discovering that there is no tumour in his liver, he happily begins to recover his health. He also tells us his own story, how he contracted tuberculosis in 2004 and the diagnosis was anything but optimistic. But Yeshi paid little attention to his illness, preferring to focus on his faith. He did not worry too much, took western medicine for a year, then Tibetan medicine. He made a full recovery. His own experience allows him to impress upon his patients the power of belief and positive thoughts. Body and spirit must be seen and treated as one. 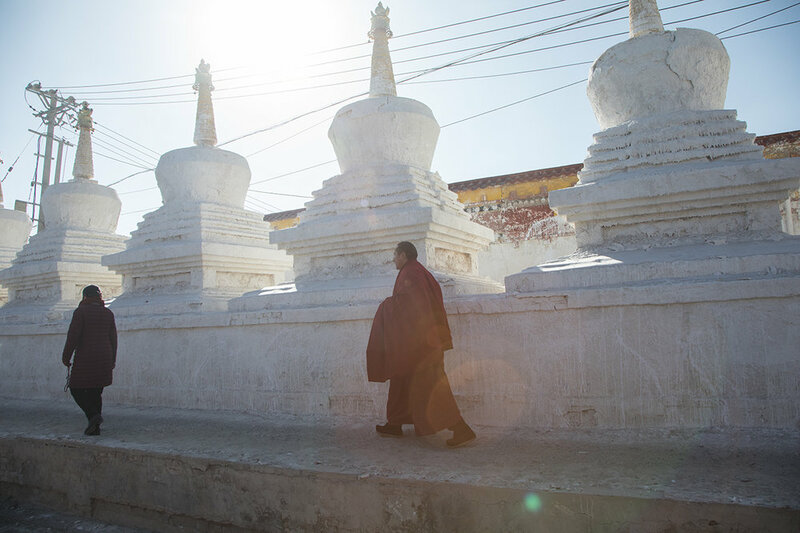 We continue our chat, a friend of Yeshi's translates as Yeshi only speaks Tibetan. His friend seems to leave out whole chunks of conversation, answering many questions himself, but our urge to communicate is strong and the translator comes round. Magically attracted to Yeshi, we return time and again over the next few days. We have so many questions. Soon he will return to daily life in the monastery, giving up his role as a doctor. He was only helping out temporarily and his final exams await. As a geshe he will teach and train monks, protect the wisdom of Buddhism and further his own education. For the rest of his life. I send him photographs a few days later. He writes to thank me, poetically describing how these pictures come deep from the heart. He senses our connection, a gift for him. He will pray for us wherever we are and wishes us a happy, wonderful life.